It seems the only reason Emily was able to get a gun permit in Washington D.C. was because of her ability to prove that she was in a dangerous situation. She was able to succeed because as a reporter, it’s common to get threats. In this case Emily submitted one report of threats against her, and another of an FBI warning about terrorist groups targeting journalists. For the average person, it’s going to be pretty hard to prove that you are in some sort of special danger, so don’t count on it. Read on for the full article. Well it’s not impossible, but it is extremely difficult, as only 16 of 76 applications have been approved in recent months. 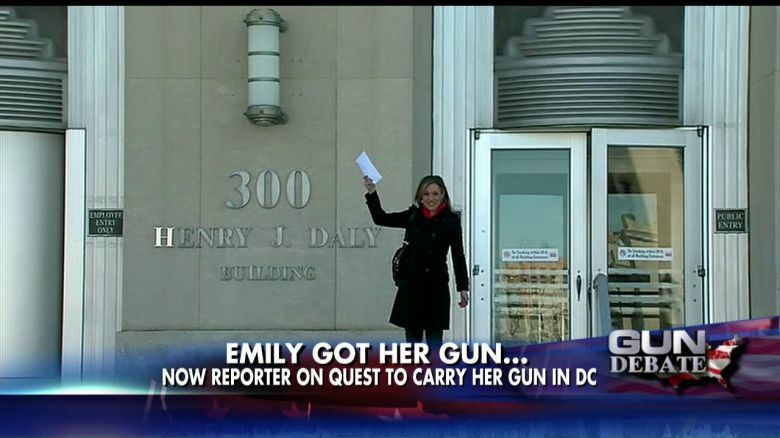 WTTG reporter Emily Miller, author of Emily Gets Her Gun, was one of the lucky ones, applying for a permit after a federal judge ruled last year that the city’s ban on guns outside the home was unconstitutional. Miller said she started the process with “little hope” of success, as a police officer immediately cautioned her that she was unlikely to be approved. “A year ago no one could legally carry a gun in D.C. Today, there are 16 of us who can exercise our Second Amendment right to bear arms,” she said. Miller said the purpose of her report was to show how the city is complying with the court’s decision.